Tucked away in a corner of Napa Valley known as Oak Knoll, the Materra Cunat estate sneaks up on you out of the bucolic vineyards of the eastside. This 50 acre property was purchased by the family in 2007, and through the use of modern technology and an expert wine making team, has developed in to a world class winery. The farming roots of the Cunat family are deep. Brian Cunat was raised on a farm in Indiana, and his 17 lifelong pursuit of travel, wine, and vineyard explanation with his wife Miki have instilled a passion in him to create his own world class wine. His first visit to Napa had him enthralled with it’s natural beauty, and the rest is history. On a particularly splendid spring day, I met with the Cunat’s youngest daughter Neena to taste through the Bordeaux inspired wines. With a special focus on Merlot, Cabernet Sauvignon, and Bordeaux blends, Materra is able to showcase the expression of both the estate fruit, as well some additional sources in nearby AVAs within Napa Valley. The stand out wines for me were the Right Bank Reserve and the Howell Mountain Cabernet, which offer a special look at what Napa Valley can offer. While not estate, these are wines to pay attention to. An homage to the Right Bank of Bordeaux, which is typically based on Merlot, with it’s silky tannins and grippy dark blue and black fruit. This is a wine for the ages, and should be tucked away for a while as the sharp edges blur and become calmer, as any age worthy Bordeaux would. Howell Mountain is one of my favorite areas for Cabernet because of the cooler, acid driven growing climate. High above the hot valley floor, the inversion layer adds an intensity and brightness to Cabernet that is often lost on wines from lower in the valley. A classic blackberry note with leather, tobacco and a pinch of black pepper round out this lush winter warmer. 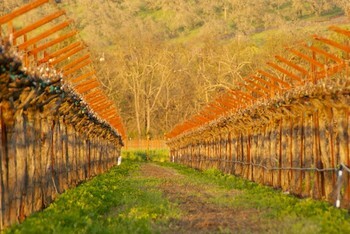 Materra Cunat is located on Big Ranch Road in Napa, and is available by appointment seven days a week. The peaceful patio is a wonderful way to enjoy your afternoon so be sure to stop by next time you are in Napa. Special thanks to Neena Cunat Heitz and Fineman PR for setting up this visit at this unique piece of modern history.